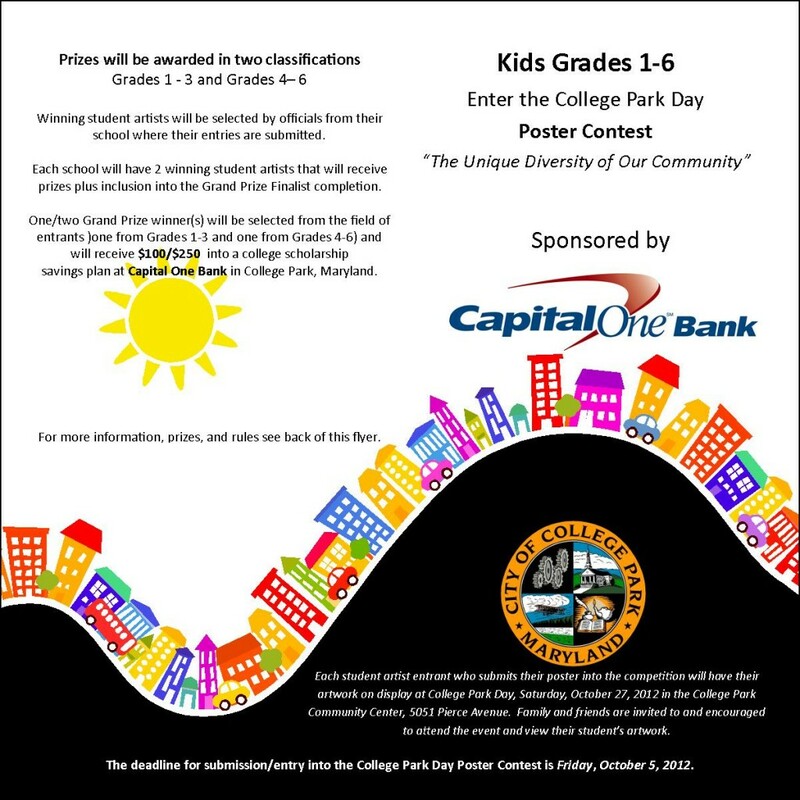 City of College Park, as part of its celebration of the College Park community on the third annual College Park Day, October 27, 2012, is again hosting a poster contest for local schoolchildren. For the first time Capital One Bank is sponsoring the poster contest and will be awarding a grand prize of a $100/$250 college scholarship account at their financial institution to the overall winner. In addition to the poster contest, there will be a variety of things for the entire family to do while attending the event: Visit the exhibitor booths and do a little early “safe trick or treating”, be sure to wear a costume and get in the festive spirit! Check out the Green living area and find out how to reduce your carbon footprint. Are you a Harry Potter Fan? Watch the Quidditch exhibition on the grassy pitch by our own Maryland Flying Wizard Turtles! Stop by our sponsor’s booths and get information to start your kid’s college savings account and other financial information, or by one of over 50 community or exhibitor booths and buy some unique items or get some literature from our community partners! Maybe you are a budding tennis superstar? Head on over and hit some balls around at one of our sponsors, the Tennis Center at College Park’s mobile court at the event! Want to go Roller Skating in the Gym at 1pm? The mobile truck will have skates or bring your own! Are you hungry? A traveling culinary carnival will feature savory delights from around the globe, and Curbside Cupcakes will bring cupcake bliss to all of your senses! Our food area will also feature award winning BBQ, Hot Dogs for the kids as well as delicious pupusas. On stage we’ll have a variety of entertainment for the eyes and the ears! Bring the kids so they can have fun on the giant inflatable castle or obstacle course, play some ring toss and get their faces painted. Ever want to try on firefighters gear or check out the Bomb Squad’s super cool robots? Go climb a wall with the Maryland National Guard on their 20’ wall. You can do it all at this year’s event! Free admission to the College Park Aviation Museum. Each school will submit their 2 winning student artists into the grand prize finalist competition. A committee of distinguished and special guests will judge the poster contest finalist competition between 11:00am – 1:30pm at the College Park Day event on Saturday, October 27, 2012. The finalist will be named onstage by the Mayor of College Park and distinguished guests at 2:30pm. One grand prize winner will be selected from the field of finalists and will receive a $100/$250 college scholarship into a State 529 plan or Coverdell Education Savings Plan at Capital One Bank. The grand prize winner’s parents/guardians will be contacted by the sponsor/ bank following the event to make an appointment to come to their local branch and open an account/add the grand prize scholarship money into an existing account for the grand prize winning student.